Okay, who turned up the heat on the hot tub? "Remember folks, if you die of boredom you do not get a free coffin. Sorry." Notable for being the last MST3K that ever aired on cable TV, when its rerun contract with the Sci Fi Channel expired at the end of January 2004. Also notable for being the only episode in the original run to riff an animated feature. Servo changed into a beautiful butterfly! His proboscis grosses out Mike though. Mike finds Servo back to normal, but the proboscis is still there. At Castle Forrester, Pearl urges Mike, Crow and Servo to put on their penguin costumes. They put on their animal costumes, but reveal the futility of Pearl's prank. Traumatized from today's short, Crow and Servo show Mike their clay world, where well meaning robots are oppressed by quirky clay mounds. As the two Bots break down from the clay mounds' prejudice, Mike makes a note for Pearl to go easy on Gumby shorts. Crow and Servo crank call the film's distributors for their free coffins, but their plan goes too far ahead as Servo ends up ordering one. Crow scares Mike as a screaming skull, but Mike goes overboard with fear. The coffins arrive at the SOL, which Mike signs for a unwilling Servo. Bobo, in a monkey costume, calls Mike and the Bots for his urgent message, but receives their disapproval. He gets shrunk by Brain Guy for his trouble. Blooper: In Universe, Mike calls out the tip of Gumby's head being on the wrong side (viewer's left instead of right) at the Clokey Production vanity card. Brain Bleach: The ending of the short causes Servo and Crow to go into Heroic BSoD. Crow: Now I'm ready for years of powerful Adlerian therapy, Mike. Servo: They hung his head. Aaugh, this is worse than Se7en! Mike: (as Gumby) Hey, you can throw things through Dad! I'm gonna get an anvil. Creator Breakdown: In-Universe. After seeing the short, Crow and Servo spend a host segment doing a skit about poor innocent robots being victimized by obnoxious clay creatures. They can't even finish it because they're so distraught. Mike implies that Gumba has "threatened to make [Gumby] into a bowl" for all the damage the robots have done. Again at the end when Mike riffs that Gumby's parents have put him to hard labor without food or water for seven days running. Dodgy Toupee: The guys briefly debate whether the black object on Gumbo's head is a matador's hat or one of these. Fantastic Racism: What does Mike think one of the robots is painting on Gumby's house? Mike: "Clay Figures Go Home!" Mike: (as Gumbo) Thank goodness for the internal genitalia. Large Ham: Ruth Eggleston, the woman (yes, adult woman, not child)note She was the wife of Al Eggleston, The Gumby Show's first artist, as well as art director. who voiced Gumby has a delivery that is somewhat stilted, high-pitched, and shoutynote "LOOK OUT THE WINDOW, MO-THER!". Servo and Crow cringe at this. Crow: "One of my classmates died in the kiln today, mo-ther!" Naked People Are Funny: During Robot Rumpus it was never an issue in any of the Gumby series, but MST3K brought it up. Narrator: But on this day, something unexpected happened. Servo: So he just goes to work starkers? Oh, the Humanity! : "Oh, in the name of all that is clay!" Running Gag: Pokey taking a dump during Robot Rumpus. Riffs mentions both Wallace & Gromit and Davey and Goliath as Gumby's neighbors. After Gumbo has a wrench thrown through his body and it heals itself, the crew gasp loudly, then Servo says "liquid metal!" When Gumbo says to Gumby in a James Earl Jones-like voice, "There's only one way to stop that robot now," Servo follows with, "On CNN." Alternative Character Interpretation: invoked Mike sees Mickey the groundskeeper as a dangerous serial killer masquerading as a simpleton. Servo throws it back in his face. Crow: C'mon Mike, how is he any different than you? Complexity Addiction: Pearl's plan to embarrass Mike and the Bots is really a badly-thought-out and lame plan on Pearl's part. "All we had to do was call fifty-three costume shops to find one that had three penguin costumes, reserve them eight months in advance with a huge cash deposit, then pay a balance of eight hundred and ninety-nine dollars per costume to rent them for an hour, then put them on, then wait until you guys woke up and finished breakfast, then call you and make believe that we had set up an appointment for you all to wear penguin costumes, and then... you fell for it! It was so simple!" Mike: You know, have people wised up to hiring people like this? Crow: Oh c'mon Mike, how is he any different from you? Epic Fail: Pearl's penguin prank, as described above. She desperately tries to save face, but Bobo and Brain Guy are resigned to it. Brain Guy: (sobbing) We're so stupid! Everything's Better with Penguins: "In the name of all that is good and decent, gentlemen, put on your penguin costumes!" Faking the Dead: In order to try to scam his way to a free coffin, Servo calls up the film's distributors and claims that he his friend died while watching it. He panics and tries to back out, but ends up having to pay shipping both ways on his coffin (on Mike's credit card). Forced Perspective: A gratuitous shot of Bobo being held in Brain Guy's fist, as punishment for dressing up like an ape. Jenny: (referring to the book she's reading) It's called Beast in the Jungle. Servo: It's about what to expect on my honeymoon. Then they calm him down by convincing him it's just Crow pulling a prank. Only for Crow to perform another little "scream", sending Mike into screaming hysterics again and swinging the golf club, taking the top of Servo's head in his panicked attack. Hearing Voices: Referenced and parodied. Crow: Meanwhile, inside the Reverend's head, a fire raged on. Crow (as Marion, as Eric is looking upon her tombstone): Oh, and I suppose you screwed up the murder of your second wife, too! Why can't you kill properly, like the other husbands?! Jump Cut: During the movie, there's a very noticeable skip in the film stock, causing Servo to dub Jenni's voice: "The film broke and it was horrible!" as she fearfully runs into Eric's arms. Kubrick Stare: How Mike and the Bots react to Bobo's failed prank. Metamorphosis: In the first host segment, Tom Servo has become a beautiful butterfly! By the second segment, he's back to normal. Servo: (brightly) But I still have my proboscis! Crow: Remember folks, if you die of boredom you do not get a free coffin. Sorry. Noodle Incident: This little gem. Servo: That reminds me, Mike: we're out of embalming fluid. Mike: You guys might be tempted to make a "Smoke on the Water" reference here, but I urge you to refrain. Offer Void In Nebraska: Crow's response to the disclaimer at the film's start. "Offer void in Utah, Florida, and Arizona. Taxes and acquisition fee not included. Must take delivery of dealer's stock." Padding: invoked Many jokes are made of the movie's attempt to draw out the suspense way too much. Tom: It's like they had two servings of tension that they're trying to stretch out for seven people. Crow: (as Jenni hems and haws over investigating the strange knocking) Can we help you, movie lady?! Do you need a push or something?! Mike: Nice pad he's got there. Mike: Now that's a real dead head. Referring back to the movie's promise of free burial services if you die of fright while watching it. Mickey having a victim or victims in his shed. When Eric hears Jenni's screams. Crow: Oh great, she's playing her Yoko Ono albums. 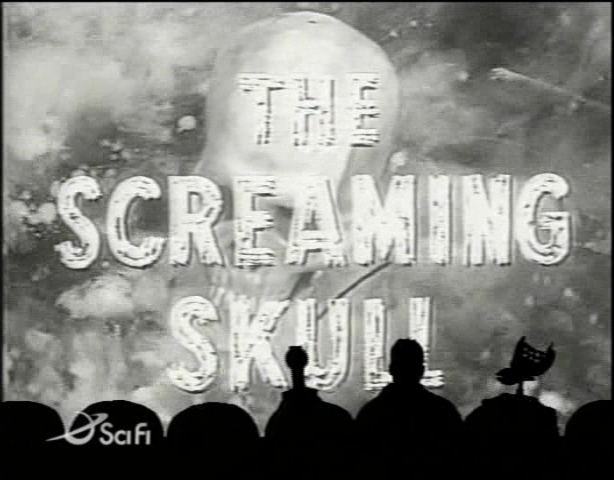 Mike: I think the title was supposed to be Screaming; Skull. The skull's knocking is compared to Gandalf and Martin Luther. Crow: Yep, when you think shocking horror, you think German oompah music!